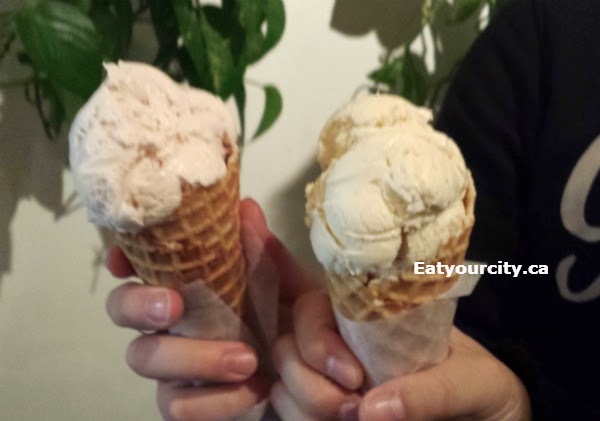 Eat Your City: Village Ice Cream Calgary, AB - I'm screaming for locally made, artisanal, small batch homemade icecream! Yum!! 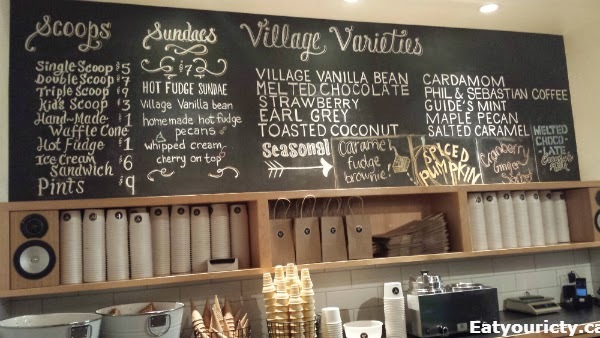 Village Ice Cream Calgary, AB - I'm screaming for locally made, artisanal, small batch homemade icecream! Yum!! At the end of a nice stretch of parking, Village Ice Cream is tucked waaaay at the back of a wide plaza and constantly has line ups out the door, folks piled up inside noshing on ice cream, and definetely a a happening place to bring your significant other, friends, family or just yourself to eat some tasty icecream. The delicious scent of vanilla waffle cones draws you in like moth to a flame. As soon as you enter, there's a blackboard menu, and the heavenly smell of freshly made waffle cones nearly knocks you senseless... that would probably explain the goofy smiles everyone had on their faces as soon as you go in lol! And here's where the magic happens to make the deliciously crisp and super vanilla scented waffle cones! The cousins each got coconut - creamy and not overpoweringly coconutty, and Village Vanilla Bean - creamy awesome vanilla (sorry no pics! ), while others in our family had multiple Earl Grey icecreams all around. We both tried the salted caramel and the cardamon (Chai heaven!) and ended up trying a lusciously creamy strawberry icecream that tasted of sun ripened strawberries (left), and Earl Grey (right) that was nice and creamy and had plenty of Earl Grey flavor. The cones were super crisp and vanilla-y and nicely stayed un-soggy until we got to the last bit of icecream. So whether its dessert after dinner, a snack with friends, family or a special someone, or just because its Canadian to eat ice cream especially when its snowy and cold out... you have to head here for some delish ice cream!